Love this! 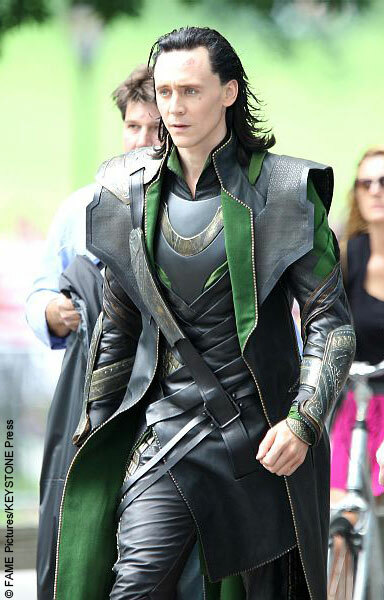 Loki is definitely one of my favourite marvel characters and you can definitely see it in this outfit! For me, being a huge harry potter fan, anything outfit inspired by the series would be awesome. What you think about following each other? I can totally see the Loki inspiration! I love the green chiffon blouse and the statement gold necklace. This is amazing! Since you've done Loki, you should try to tackle Thor! It could look really cool if you have anything within that colour palette. Maybe leggings, a sweater, and a vest? Or a blazer? And maybe some sort of silver hair accessories to represent Thor's helmet, albeit non-existent in the Avengers... Just throwing things out there! I should really do this...I specifically bought a shirt and bracelets to do just this but thought it was a silly idea, since I think I was one of two people in my blogger cluster of girlfriends who saw the movie. (And the only one to see it three times.) I might totally do that now. I really like the necklace and sweater. I actually didn't get the Loki reference until I saw the picture of him...way to make a superhero costume look classy + pretty! You look so LOKI. I lovelovelove this outift! Now you just need the creepy smile! Great look! Love your blog! I am you newest follower! Follow with gfc and bloglovin now! I hope you would like to follow me back!! Waiting for you! This is such an incredible outfit. It's great to see Loki-inspired outfits that are actually wearable in every day life, as Loki is one of my favorite fictional characters, spanning from the Marvel movie to the comics and cartoons to the actual Norse god. I love this outfit because the inspiration is both very apparent and totally subtle. Love your look, both with and without the jacket! i actually find loki quite charming! lol another wonderful outfit! Love this outfit ♥ You've got amazing hair !!! I love your interpretation on his uniform, you look much cuter than him though! I am now inspired to dress like my favourite superhero! i loved how you got the inspiration for your outfit ! like a superhero look an turn it into something very cute. i saw that your from california an that you wanted to do something with fashion?